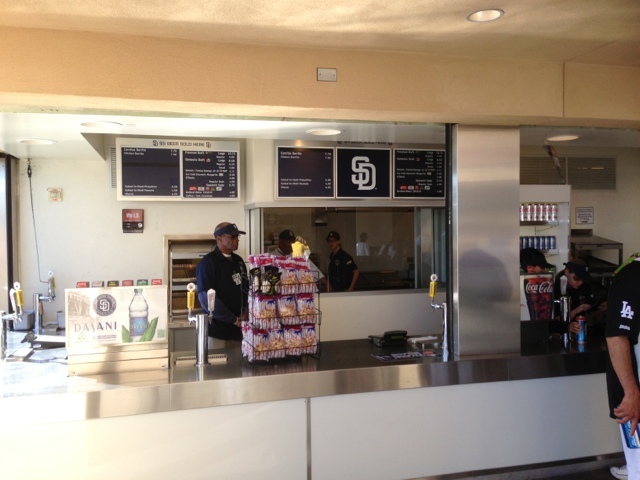 New Petco Park Food/Beer. Beer Prices Hiked! 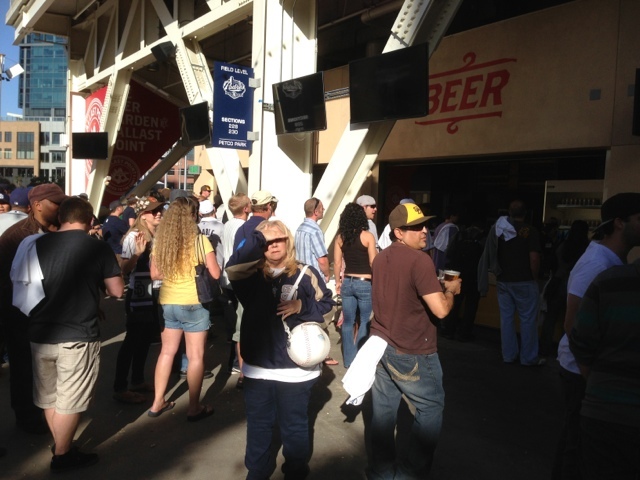 Opening day at Petco Park is always one of the most exciting days of the season. Not only is the place sold out, but the crowd is always super into the game, a little boozed up, and the atmosphere is usually electric. Tuesday’s opening day was particularly excellent due to the Padres breaking form and winning… no… CRUSHING the stupid Dodgers. Sure Clayton Richard threw 100 pitches in innings and looked anything from dominant. Sure Carlos Quentin got hit by a pitch and had to leave the game like a little baby due to a bruise. But the Padres’ bats came alive in the new era of shorter Petco fences. 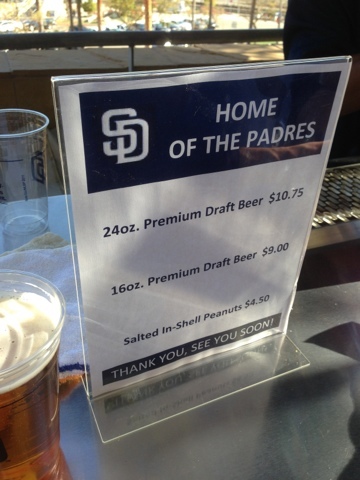 HIGHER BEER PRICES – This was not announced beforehand by the Padres, nor have I seen it mentioned by any of the other Padres blogs or Twitters. The craft beer 24 ouncers are now $10.75, up 7.5% from last season. Since I am not a total pansy, I’ve never ordered the smaller size and am thus not sure what they cost last season, and whether there’s a price increase this season. 75 cents doesn’t seem like a huge increase, but multiplied out to the literally hundreds of beers that will be consumed this season, it adds up. going to pull in way more people. Pricing on the cans was very high, and there is really no reason not to just get the 20 oz. Sculpin for a couple bucks more. Considering Sculpin can run 6-8 bucks at some bars, the $10.75 (the new large craft beer price) for 20 oz. isn’t too bad. A welcome addition for sure, but deserving of more prime real estate (can we get rid of the Kona Longboard lounge in LF and replace it with a San Diego connected brewer?!). in the Mercado has no signage yet, and the only thing offered on their menu are carnitas and chicken burritos. Very disappointing. All I want is for San Diego’s cuisine to be represented at the park. To me, that is California burritos and fish tacos. Garfinkel, get on this. To be fair, it might be the regular Padres food contractor doling out mediocre burritos until El Pueblo can properly take over. Who knows. All I know is this stuff should be taken care of BEFORE the season, not during. Bush league. the Petco craft beer ecosystem, but only adds a couple new beers to the total selection. The beers on offer in the craft beer plaza are exactly the same as last season. Some new variety would be nice and less Oregon and “Hawaiian” beers would be welcome. food stand, either of which would be serving some San Diego produced products.